The most complete guide for anyone looking to gain an understanding of Business Continuity Planning (BCP) and its practical application in an IT and Non-IT environment. This certification kit would be beneficial to individuals planning to implement and manage BCP processes and strategies, business owners and managers looking to protect their company from potential risks, and businesses experiencing internal or external threats to production, information, and/or services. The Business Continuity Planning Certification Kit contains a study guide eBook and online course, and is delivered to you via our eLearning portal, giving you the freedom to access it anytime, whether at home or in the office. The Business Continuity Planning Complete Certification Kit is a part of the Core Series for IT, a series of courses available to help career-driven IT professionals stay relevant in their roles in the I.T. industry. Each course in the core series includes a certification upon successful completion. Discover the essential risk recovery and preventative method known as Business Continuity Planning. Business Continuity Planning has become a vital resource used by organizations to ensure the long lasting success of business services. Become a valued member of your organization by learning the benefits and advantages of implementing Business Continuity Planning processes and management. Business Continuity Planning (BCP) refers to proactive planning processes that are implemented to ensure business operations and service standards are maintained in the event of exposure to internal or external threats or risks. BCP aims to provide effective prevention and recovery procedures for the business to be successfully resilient in the face of threatening obstacles. A BCP ensures that an organization has the resources and knowledge to deal with a number of emergencies. This certification course would be beneficial to individuals planning to implement and manage BCP processes and strategies, business owners and managers looking to protect their company from potential risks, and businesses experiencing internal or external threats to production, information, and/or services. This certification validates that you know specific methods, models, and/or tools. This is essential to professionals in order to be updated on the latest business trends, and to add to their Business Continuity Planning toolbox. The industry is facing a bold, new world with the amazing developments in Business Continuity Planning, and the challenges and the opportunities this presents are unprecedented. 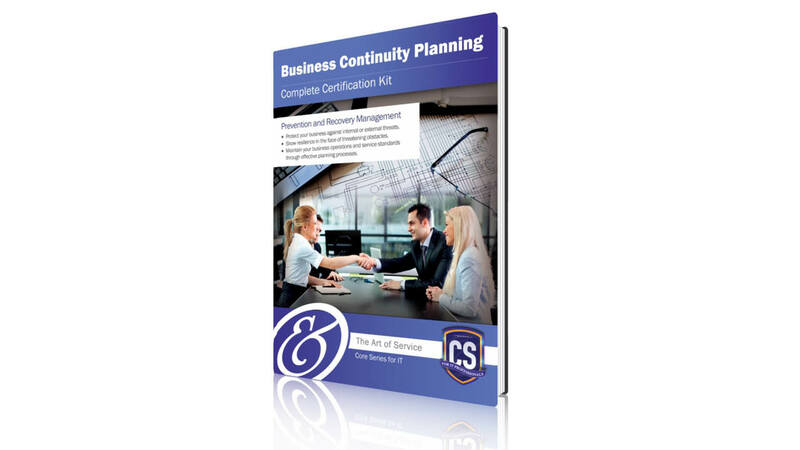 The Business Continuity Planning Complete Certification Kit serves as a complete introductory guide for anyone looking to grasp a better understanding of Business Continuity Planning concepts and their practical application in any environment. 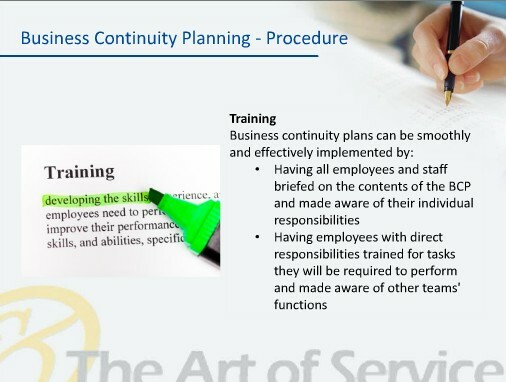 The Art of Service's introductory Business Continuity Planning training and certification helps IT practitioners develop the skills that are crucial, as businesses embark on this massive transformation. It provides an industry credential for IT professionals to help them transform into the world of Business Continuity Planning. This training and certification enables you to move both the industry and business forward, and to quickly take advantage of the benefits that Business Continuity Planning applications present. The Art of Service IT Service Management programs are the #1 certification programs in the information management industry. Being proven means investing in yourself and formally validating your knowledge, skills, and expertise by the industry's most comprehensive learning and certification program. The Business Continuity Planning Complete Certification Kit course prepares you for Business Continuity Planning Certification. - Learning about Business Continuity Planning technologies has never been more affordable. - Latest industry trends explained. - Learn from the Experts. 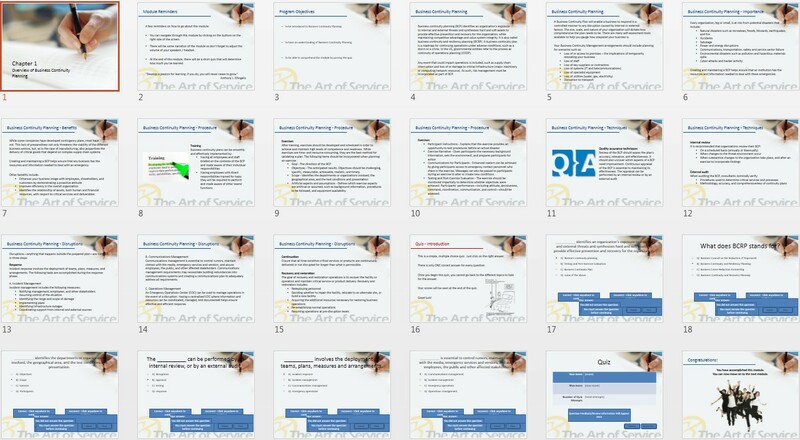 The Art of Service offers education about Business Continuity Planning and 300 other technologies by the industry's best. - Learn the important concepts, tools, and strategies of Business Continuity Planning. - Learn about the benefits of implementing Business Continuity Planning to prevent business failure. - Examine the BCP Lifecycle and the encompassing tiers of BCP. - Review Emergency Management processes. - Learn about the possible risks and threats that businesses face.